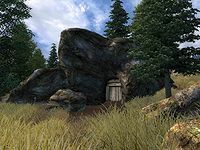 Brittlerock Cave is a medium-sized cave northwest of Kvatch containing daedra (quest-related). It contains two zones: Brittlerock Cave and Brittlerock Lower Passages. 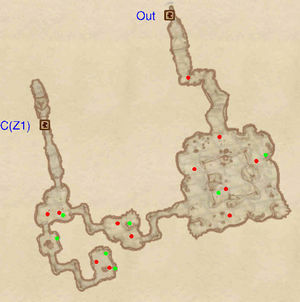 Elante of Alinor is only present during the related quest. After the quest, she can be found in front of the door to Brittlerock Lower Passages. This cave contains 7 Cairn Bolete plants and 11 Wisp Stalk plants. The exterior is located at coordinates: Tamriel -42, 3. 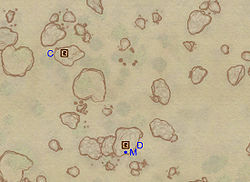 This location's map marker (M on map) is named Brittlerock Cave (editor name BrittleRockCaveMapMarker). The entrance door is N of the marker, 10 feet away. The following plants can be found near the entrance: 2 Lady's Mantle plants, 8 Motherwort plants, 4 Viper's Bugloss plants, and 6 Goldenrod plants. 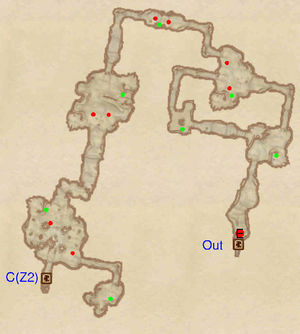 If you are on the related quest, you will immediately find Elinor at E. Either way, press forward, looting a nearby chest. In the next room you will face two Daedra guarding a minor loot chest. The tunnel to the west snakes down to a room with another chest. Don't bother pressing further ahead as the following room contains nothing but bones. Track back and head northwest. The next three rooms each contain two Daedra and a minor loot chest. 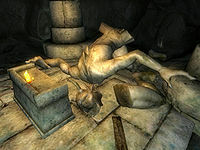 In the final room, you will find the object of Elinor's interest: a lost Daedric shrine to Molag Bal. 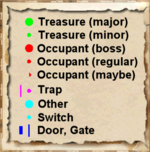 A small room to the southeast contains a minor loot chest, while door C leads to the next zone. The first room you enter contains two Daedra and a minor loot chest. Head south to access three more minor loot chests guarded by two more Daedra. Track back and follow the path eastwards, battling two Daedra and looting another chest on the way. In the middle of the final room is a lake with a slaughterfish and chest inside. Four Daedra stalk the perimeter of the lake, so try to avoid fighting all of them at once. Another minor loot chest is found in the northeastern corner. Once they've been dispatched, head north, slay one last Daedra and exit the cave through a secondary door (Out).